This compact Bosch Ascenta 300 front-loading washing machine is Energy Star rated for high efficiency. Its load sensing technology prevents you from wasting unnecessary water. The spin cycle is so effective that clothes come out almost completely dry. We also appreciated the sanitary cycle, which leaves clothes extra clean and disinfected. 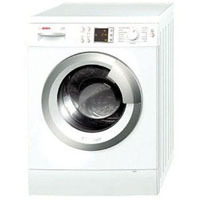 Sleek and modern-looking, this washer has excellent performance. It’s also a pretty energy-efficient washer. It costs an average of $14 in electricity to operate it for one year. That’s an average, but it’s going to be a cheap appliance to run regardless. If your current washer is an electricity hog, the high price of the Bosch WAP24200UC will pay off in the long run.